Bread is the most versatile ingredient in our kitchen. We can make a wide variety of dishes with this humble ingredient. I always think of new ways to make everything and it must taste better too. I love culinary endeavor. Whether its a breakfast, lunch, brunch, snack or dinner I need an unusual twist to any dish that I make and eat. Experiments in snacks are the one which I love the most. Bread, potato, banana are the three favorite ingredients which I love to experiment with. This bread chicken pakoda is one among the same. If you are looking for some recipes to use up your leftover fried chicken, fish or meat, then here is a simple recipe to save your food and money. The wise way to use up leftover meat and leftover bread sides (make breadcrumbs). 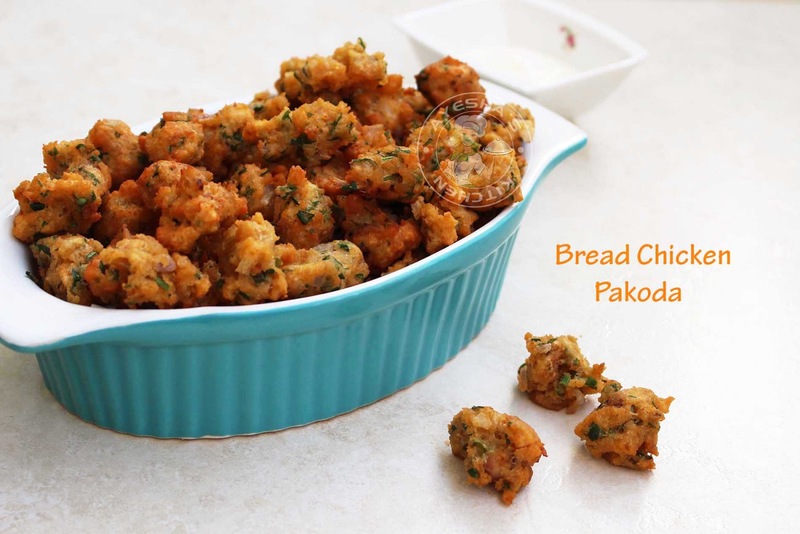 This pakoda can be prepared with any leftover fried meat. I made this pakoda with leftover broasted chicken that adds lots of flavor to this simple snack. Such snacks will give your leftovers a new life. Isn't it? And the parsley leaves, which is popularly known as baqdunas leaf in Arab countries give this pakora or pakoda a special taste and look. Baqdunas leaf has got lots of medicinal value and is widely used in salads and soups in Arab countries. 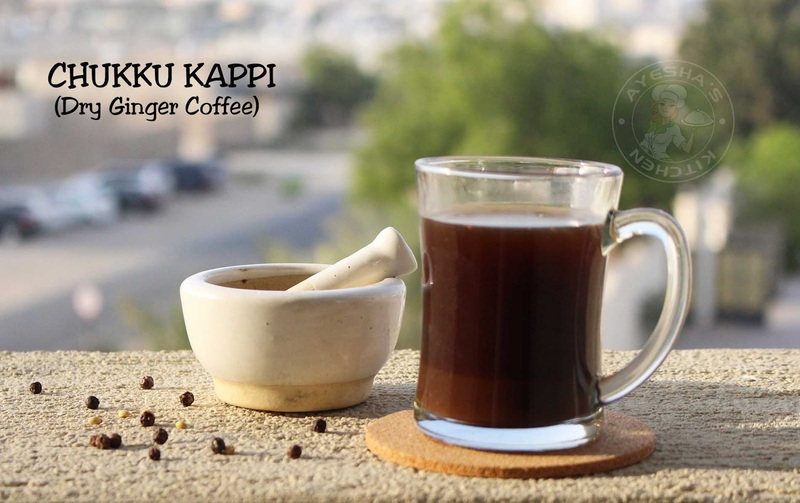 It is good for lowering blood cholesterol, rich in antioxidants, vitamins, minerals etc. 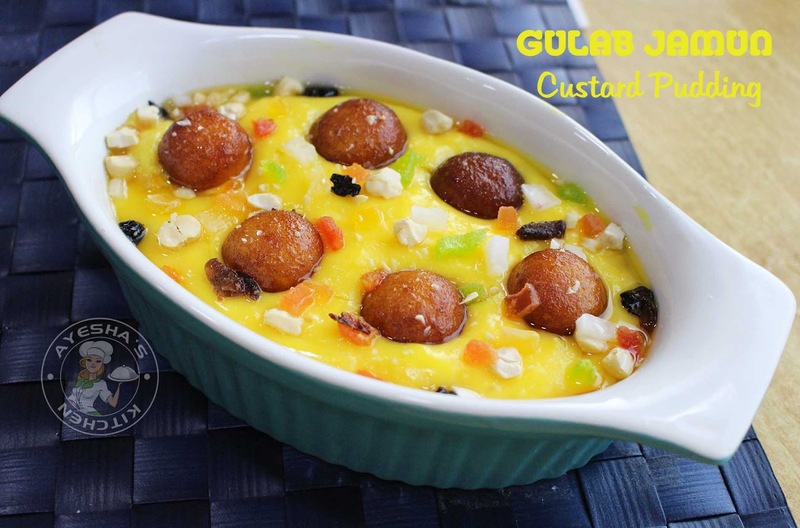 As Ramadan is very close many are requesting for Ramadan recipes and iftar recipes. I know you all will be searching for delightful and healthy Ramadan recipes. But still, we do love cheat meal to satisfy our food cravings especially the craving for fried items during Ramadan. 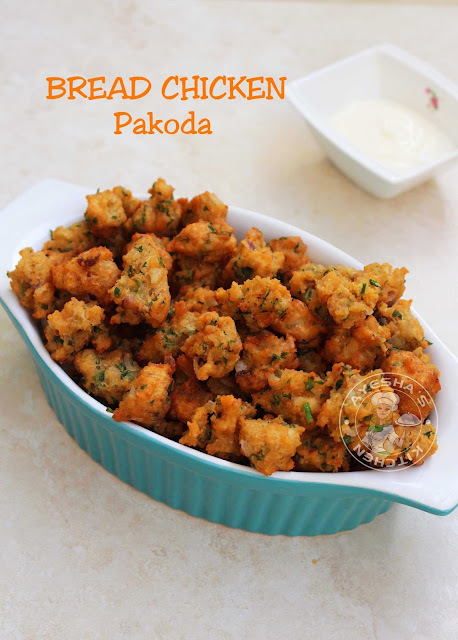 So let's move on to the recipe showing how to make bread chicken pakoda or pakora. 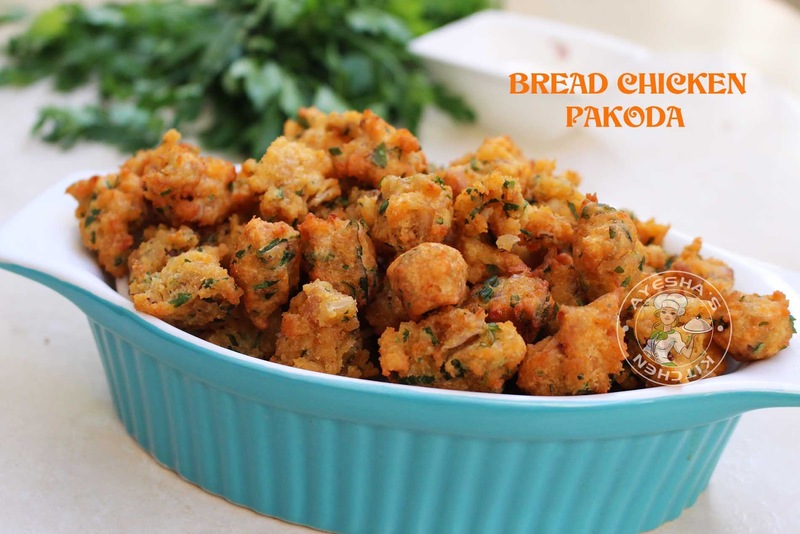 Hope you all will surely love this snack recipe with chicken and bread. Here is the recipe showing how to make bread chicken pakora/ bread snacks/ chicken snacks/ Ramadan snacks/ iftar recipes/ easy recipes for iftar. Take a large bowl and make a thick smooth paste using gram flour, chili powder, salt, and water. You have to add the water little by little only. Be careful that you have to make a thick smooth paste only. Once done, add the baking powder and mix well to combine. To this paste, add all other ingredients one by one except oil. Add the chopped onion, chopped parsley leaves, chopped fried chicken (i used leftover broasted chicken for making this pakoda), chopped green chilies (if any), and finally the breadcrumbs. Combine all these ingredients well using a spoon. Then knead it to form a smooth dough using your hand. You can sprinkle some water to wet the dough (do not add more water). Now heat a wok or kadai with oil for deep frying. Make very small balls out of this dough and slide it into the hot oil. Deep fry it until golden and crisp. Make sure that the oil must be medium-low while frying. Fry until golden and crisp. Transfer it to a plate and drain the excess oil using a paper towel. Crispy, soft chicken pakoras are ready to eat. Again am back with yet another humble dessert using the humble ingredient "Bread". Bread pudding is very popular around the globe. Even for the beginners, I highly recommend this bread pudding recipe as it never goes wrong. 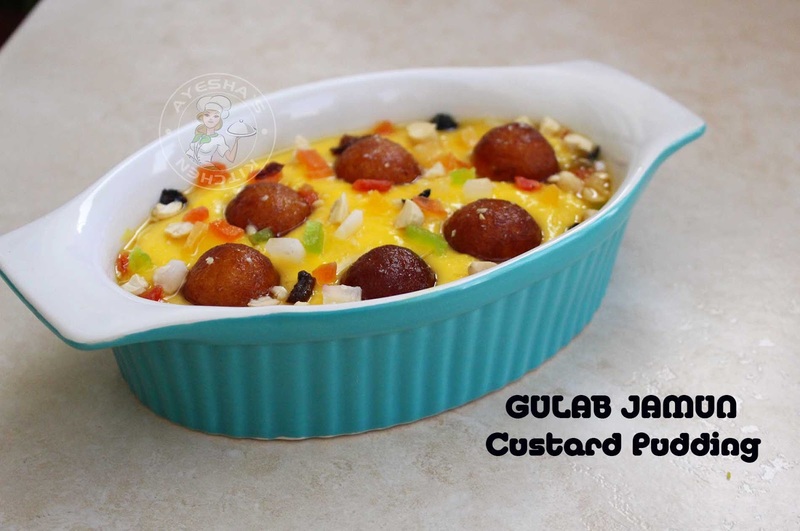 So simple and humble dessert that I would love to make again and again. Yes, this is the dessert that each one of us is looking for after a delectable lunch. It's really yummy and melts in our mouth. Bringing some sweet treats that favor simplicity is something comforting and satisfying for me. Like so recipes with bread are always my favorite. Bread snacks, bread desserts, bread pancakes like so we can make lots and lots of various dishes with this humble ingredient. Eating bread as it is, is so boring and I do prefer trying out some tasty recipes with bread instead. 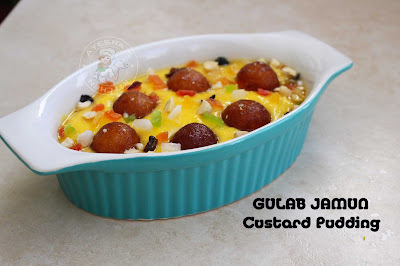 Like bread pakoda, bread sandwich, bread toast, bread balls, bread rolls, bread pudding, bread gulab jamun, shahi tukda or double ka meetha, bread chili, bread cake etc. As Ramadan is very close, I would love to share some easy and simple bread snacks and desserts for iftar too. I hope I can share those Ramadan recipes or iftar recipes as soon as possible. Now let's move on to the bread pudding recipe. 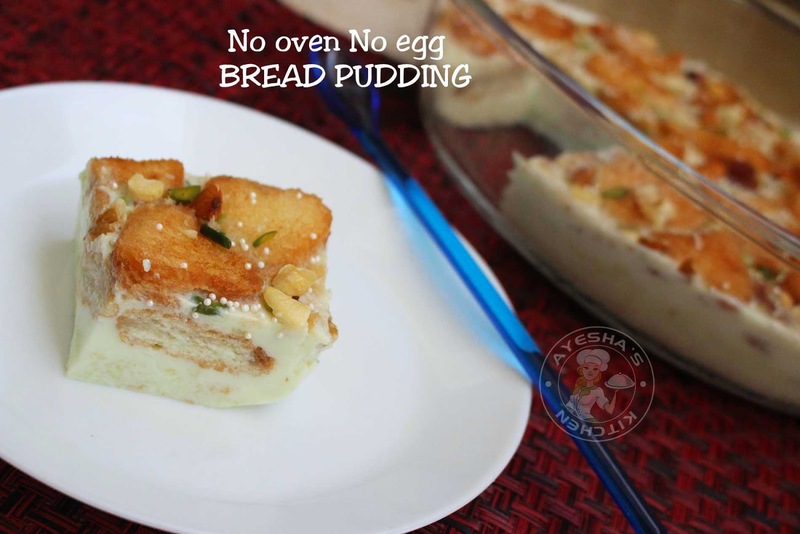 A very easy to make bread pudding recipe without an oven and without egg. Here is the recipe showing how to make bread pudding/ no oven bread pudding/ no egg recipe/ pudding recipes/ easy simple pudding recipes/ recipes with bread/ bread recipes. Take the bread slices and using a heart-shaped cookie cutter, cut the bread into small hearts. (or you can cut into round or square pieces also). And make the breadcrumbs using this leftover bread slices and sides. Set aside. Heat a pan with oil for deep frying. Fry the heart shaped bread pieces until slightly golden and crisp over a medium-low flame. When done, transfer it to a paper towel and set aside. Now let's boil the milk in a saucepan. Meanwhile, melt the china grass in another pan along with half a cup of water until it melts to a clear liquid (over a low flame). Once the milk starts to boil, add sugar and condensed milk. Mix well. Once the chinagrass melts to clear liquid, add it to the milk mixture using a strainer. Mix well immediately. 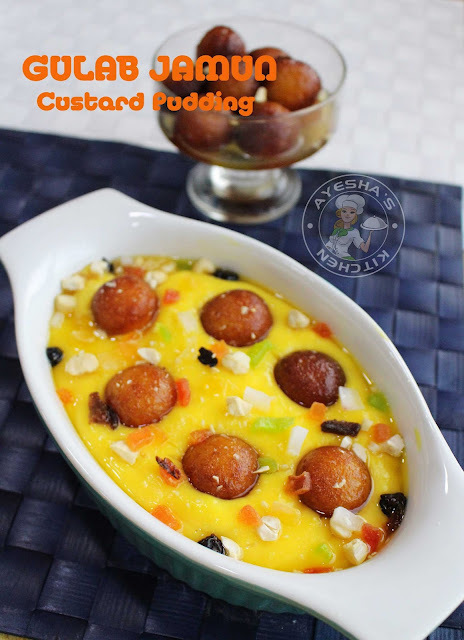 Then add half of the breadcrumbs (reserve the remaining bread crumbs while assembling this pudding) and combine well. Finally, add the pista essence (optional). Mix well and now the milk mixture is ready. Let's assemble this bread pudding. Take a pudding tray. Layer half of the fried bread pieces as the base. Sprinkle some nuts and bread crumbs over it. Then pour the prepared milk mixture over this bread layer slowly using a big spoon. Gently dip the fried bread pieces in the milk mixture using a spoon. Still, it will float on the top, but don't be panic. Now layer the remaining bread pieces as the top layer (do not dip it in milk mixture). Sprinkle the chopped nuts and breadcrumbs. Cover it and keep refrigerated for 6 to 8 hours or overnight to set. 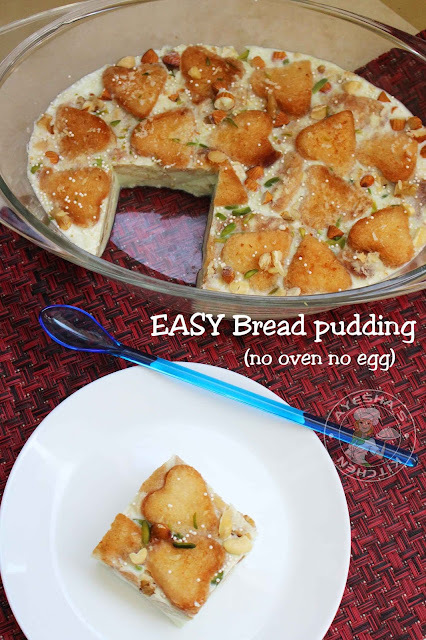 Yummy and easy bread pudding ready. While serving, sprinkle some pearl drops or chocolate shavings over it and serve chilled. 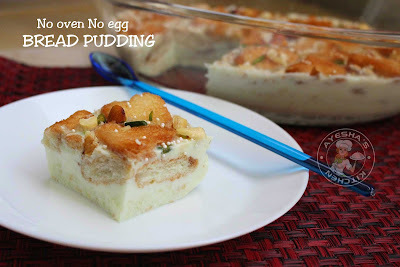 Watch the video - Easy bread pudding. Blend all these ingredients together in a blender. When done, pass it through a strainer. Strain the juice well. 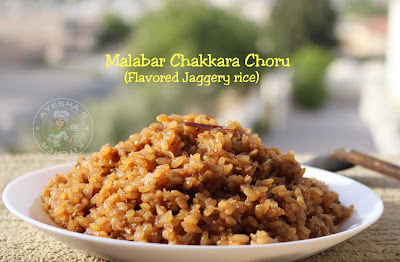 Chakkara choru (jaggery rice) is one of the popular traditional Malabar rice recipes which is prepared during special occasions like Bara'ath nombu day in Muslim households. This Malabar rice dish is usually served along with a hot black tea. Its preparation is very simple and with fewer ingredients. I always love the way my umma (mom) makes traditional Malabar recipes (especially nonveg recipes like Malabar dum biriyani, chicken korma, Malabar pathiri and kozhi curry, varutharacha chicken curry, meen pathiri, kozhiyada, koonthal nirachath etc,). Those are my favorite recipes ever. But this recipe for thenga choru and chakkara choru are my mil's recipes (mom in law). Yes, most of the traditional recipes like lamb brain fry, adalodakam omelet, jeera kanji, chukku kaapi etc are from her experienced hands (mil's). The memories of these dishes make me drool and nostalgic. Thenga choru (coconut rice) is yet another Malabar delicacy which needs no introduction. 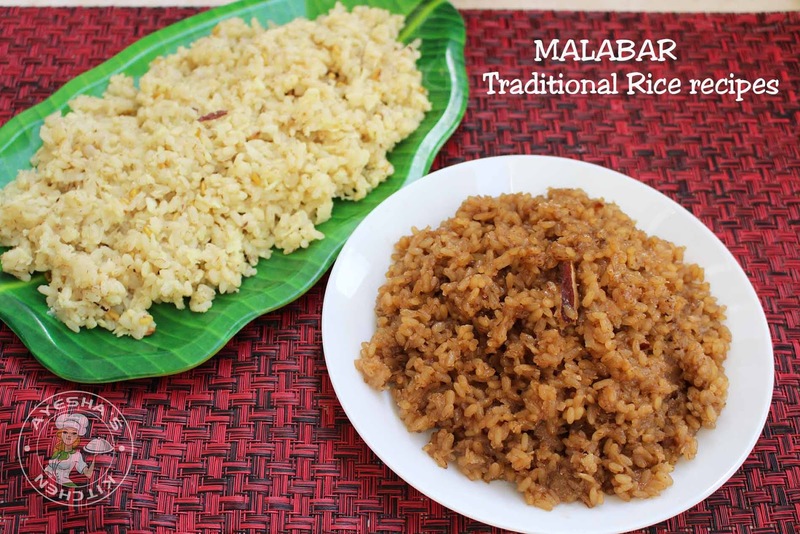 This is a must try Malabar rice dish for those who love Malabar recipes. Coconut rice (thenga chor)is always accompanied with beef pepper roast and pappadam. Before marriage, I never cared to taste this rice even though my parents compelled me to. But now, am a big fan of the same and like so my daughters, they crave for this rice dish. The aroma from fenugreek (uluva) and when that comes with comfort food, my family instinctively crave for this thenga choru that burst with flavors. So simple to make and yet delicious. Wash the rice well and set aside. To this, add 3 cups of water. Mix well again. (For a cup of rice you need 3 cups of water). While cooking, if required you can add more water. Now transfer it to a large cookware or earthen pot. 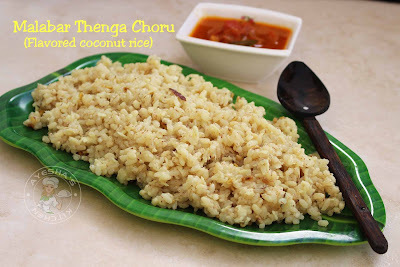 Delicious and flavorful coconut rice or Thenga choru is ready to serve. It pairs best with beef pepper roast and pappad. Wash the rice very well and set aside. In a deep bottomed bowl, mix together rice and scraped coconut. Combine it well with hand or a spoon. Now transfer it to a large cookware and add a pinch of salt. Cook covered until the rice is cooked 80 % and once the water starts drying out add the jaggery slices. (if it contains dirt, u have to melt the jaggery before adding). Again cook until the water dried out completely. Meanwhile, heat a pan and dry roast the fennel seeds until done and powder it. Add this fennel seed powder and mix well. Now let us season the jaggery rice. For that, heat the pan with coconut oil and fry the finely chopped shallots until golden. When done, pour it over the prepared rice. 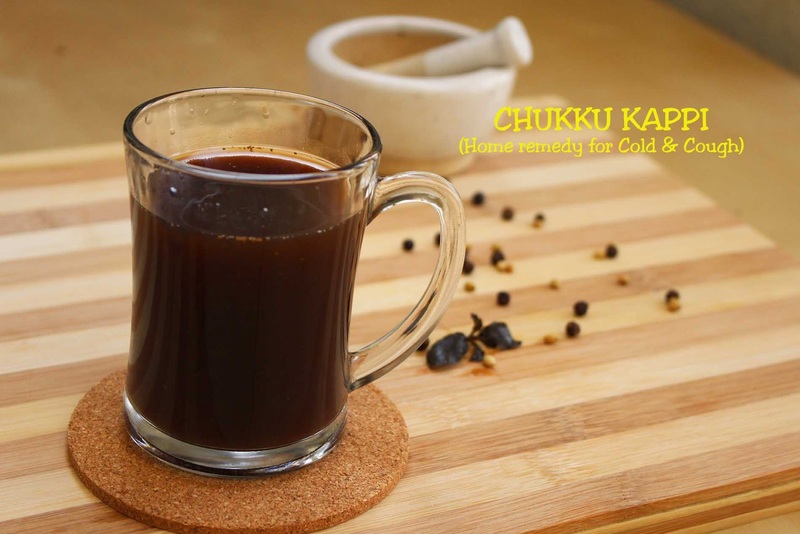 Serve this hot along with a black tea. Yummy. Milkshakes are my all time favorite thirst quenching drink. 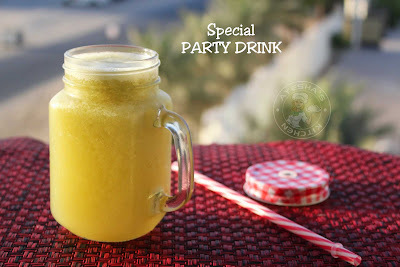 I love to have these special milkshakes whenever I hooked to some sweets or desserts. Moreover, these special milkshakes can quench your thirst as well as hunger. 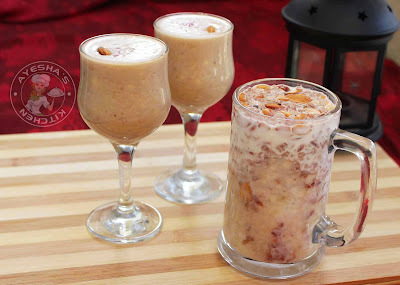 You can also have this banana mash coconut milk dessert and rice flakes milkshake as a breakfast meal as it can satisfy your hunger until lunch meal. 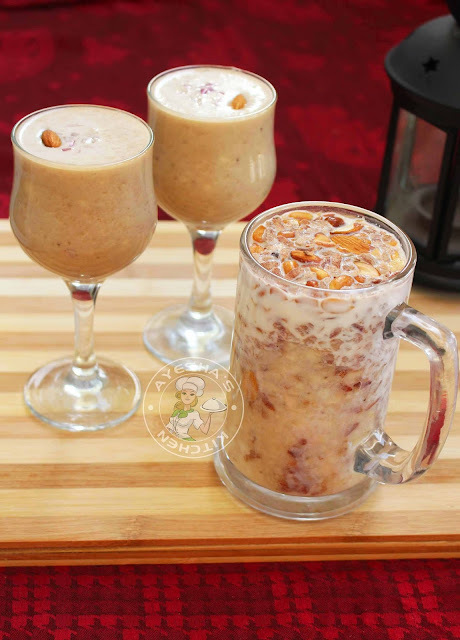 A healthy and yummy breakfast recipe. 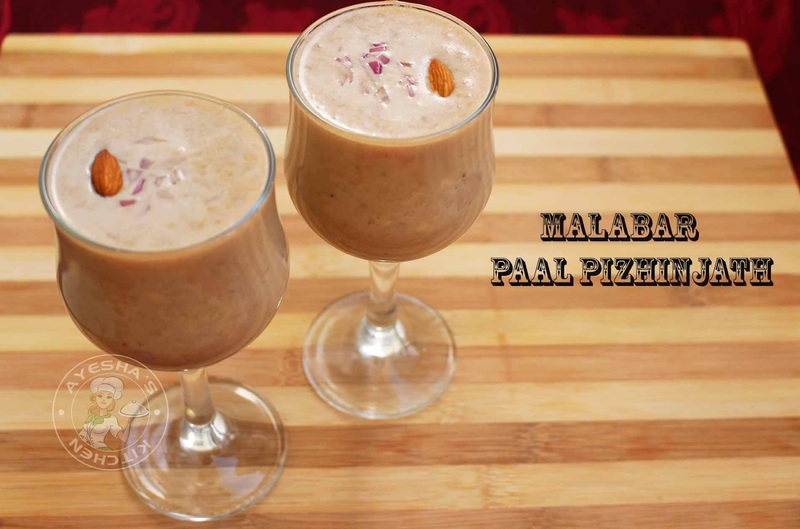 Paal pizhinjath is a very popular and traditional malabar dessert which is commonly prepared for Athazham (during ramadan). Like so, we all know that Aval milkshake or rice flakes milkshake is another popular Malabar recipe with hand ingredients. 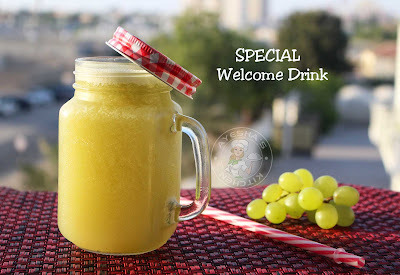 Moreover, these dessert or drink is a No cook dessert recipe. 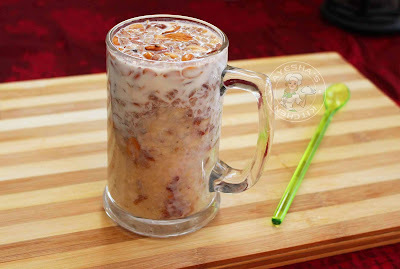 So let us see how to make these No cook recipe / aval milk shake/ Malabar paal pizhinjath/ kotakkal style aval milk/ avil milkshake/ avil milk / Malabar desserts/ rice flakes recipes. In a bowl, add banana and mash it well using a pestle or with hand. When done, add the sliced or chopped jaggery and shallots. Again mash it well. To this add coconut milk little by little and mix well. 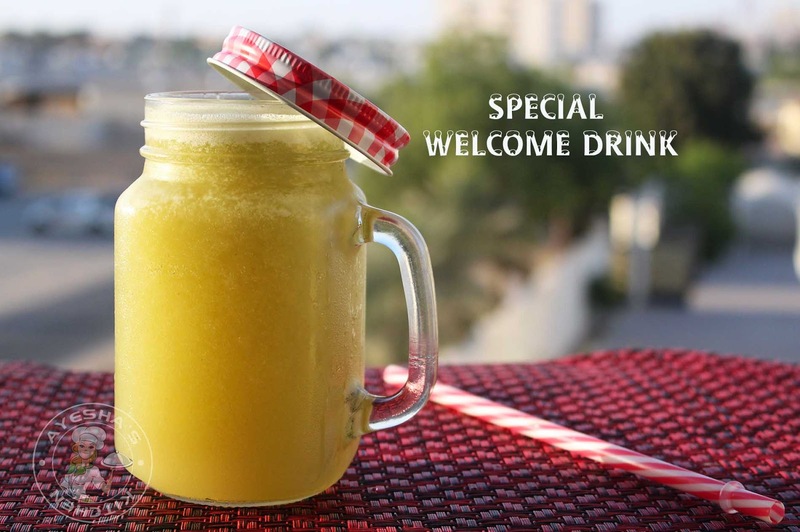 Let it chill for few hours or can serve immediately. Heat a pan and dry roast rice flakes for few minutes or until crispy over a low flame. When done set aside. You can store the leftover roasted rice flakes in an airtight container and can use instantly. In a bowl, mash the banana along with sugar using a pestle or with hand. Do not blend it in a blender. Combine it well and slide it to the serving glass as the base layer. Fill the one-third of the glass with mashed banana. Another one-third of that glass with roasted rice flakes. Then add some roasted nuts and roasted peanuts over it. Finally, pour the chilled milk over it until the top. Mixx it well using a spoon and serve. You can decorate it with a scoop of ice cream or rice flakes and nuts.